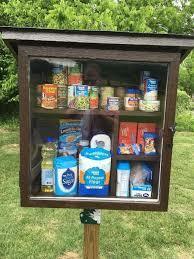 A “Free Little Pantry” is a mini food pantry where those who want and/or need supplies can go. Where: The “Free Little Pantry” is near the Andrew Little Leaders Daycare. Why: There is a local need for FREE nonperishable food items and personal care items. The “Free Little Pantry” is for ANYONE! The students of Andrew School are working to maintain and stock the “Free Little Pantry” with nonperishable food and personal care items. Please help us to stock our pantry by bringing items to school the week of August 28th to September 1st.